If you’re interested in finding the best folding exercise bike for your home, we can help. We have compiled a list of what we consider to be the best folding exercise bikes based on structural quality and durability, performance, resistance types, and noise levels, comfortability, and price, to name a few. We also felt it would be helpful to share with you the benefits of using a folding exercise bike, the different types of bikes, whether they are an effective means of exercise and losing weight, some exercise bike feature comparisons, some helpful tips on how to use your bike for better results, and of course our editor’s choice top pick. What is a folding Exercise Bike? Are Folding Exercise Bikes Effective? 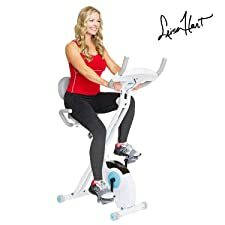 Will an Indoor Bike Help Me Lose Weight? Which Exercise Bike is the Best for You? The folding exercise bike is probably the most popular home workout machine on the market. And rightfully so. Bikes have been around for many generations. We grew up riding bikes for fun, and as adults continue to use them as transportation to and from work, or for recreational purposes. So we all feel much closer and more comfortable with the idea of using a home exercise bike over say a vertical climber or a treadmill. Nonetheless, before we jump to our list of bikes, let’s get a better understanding of what a folding exercise bike is and what it can do for you. The foldable exercise bike is a workout machine built to resemble your typical bike but is stationary and can be used indoors. This gives the user the same cardiovascular benefits of an outdoor bike, while not having to leave home. It is a great way to exercise any time of day, and without relying on the weather. The added benefit of the folding exercise bike is that it can be folded up and easily stored in a corner, garage, or closet. These bikes are also easier to move and fit through doors or tight spaces and are much lighter than the non-folding bikes. This is a great feature to have if you are lacking room in your home or apartment, or just want the bike out of sight when not in use. There are basically two types of exercise bikes. We are all familiar with the traditional upright exercise bike, but there is another type which has become very popular especially among seniors called the recumbent exercise bike. The recumbent bike is much lower to the ground which makes it much easier to sit on and get off. It is more comfortable in that is has a backrest and handles on either side of the seat for more stability. Definitely less stress on the back than your typical upright exercise bike and in most cases a better choice for seniors or anyone with back issues. And recumbent bikes can now also be found as folding exercise bikes. We have added three of these bikes to our top 8 list below. The folding exercise bike is typically much lighter than the traditional non-folding bikes and thus also comes with fewer features and add-ons. However, there are still advantages the folding exercise bike has over the non-folding bike. As mentioned earlier, these bikes take up little space and can be easily moved or stored in smaller areas. And without all the extra upgrades, these bikes tend to be much less expensive. Even the whisper-quiet magnetic resistance bikes are still very affordable with the folding feature. Exercise bikes are built to mimic real bike riding on straight-aways and various inclines. Nevertheless, some of these folding bikes can hold up to 400 pounds and are still sturdy enough to get an effective workout without any problem. Will an Indoor Exercise Bike Help Me Lose Weight? The quick answer is…absolutely! Using a stationary exercise bike is a great way to lose weight. Your body weight and workout intensity will dictate how many calories you will burn. This will differ from person to person, however, on average a 145-pound person cycling at a moderate speed can expect to burn approximately 230 calories in a 30-minute workout. If that same person were to increase the intensity level to vigorous pedaling, the number of calories burned would increase to approximately 380 per 30-minutes of exercise. In this list, we have included only magnetic-based folding exercise bikes as they are the newer technology and are known for their whisper-quiet operation. This list includes foldable upright bikes and foldable upright and semi-recumbent combo bikes and foldable recumbent only bikes for those who are interested. It is important to note that the recumbent only bikes are easier to get on and off of, and a great option for back pain sufferers and seniors. 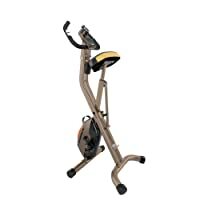 The Exerpeutic Gold 500 XLS foldable upright bike is designed with a heavy duty and high durability steel frame construction that can support up to 400 pounds. Its design makes it easy to get on and off the large comfortable and well-cushioned seat. The seat is adjustable to fit anyone from 5.1 to 6.5 inch in height. (Editor’s Choice): Voted #1 best folding exercise bike. High quality, most bang for your buck with high 400 lbs. maximum weight capacity. This bike will easily fold to half its size, with dimensions measuring 26.4” L x 24.8” W x 57.5” H, weighing 56.1 pounds and includes transportation wheels for easy relocation. The Exerpeutic Gold comes with super quiet 8 level magnetic control system so you can choose from a light workout to a more challenging workout. All of this can be adjusted with an easy control knob conveniently placed above the large computer LCD display where you can monitor your calories burned, distance, time, speed, scan, odometer, and pulse rate. Dual heart rate pulse sensors are located on the handlebars and can be monitored on the LCD display. This bike also features a ‘high torque’ 3 piece crank system and ‘double drive’ transmission system with a precision balanced flywheel for quiet operation, and a v-belt drive that provides for a high quality smooth and consistent pedaling motion. I highly recommend this exercise bike for its exceptional quality. With what this bike has to offer, you really can’t beat the price. *If you are on a budget and looking to spend a little less money, may I suggest The Exerpeutic Folding Magnetic Bike which is very similar to the Exerpeutic Gold 500. The Marcy NS-652 foldable exercise bike is a heavy duty 14 gauge steel frame construction measuring 32L x 18W x 42H, weighing 37 pounds with a maximum weight capacity of 250 pounds. This bike is recommended for users between 5.1” and 6.3”. This exercise bike comes with 8 preset magnetic resistance controls to set your workout intensity levels according to your desired routine. The Marcy 652 has an adjustable foam padded seat, counterweighted pedals, rubberized foot base to prevent floor scratching. Track your progress with the computer monitor positioned between the handles that displays your calories burned, exercise time, scan, and speed. 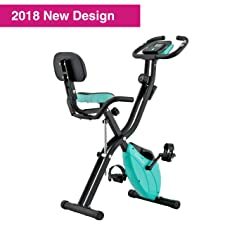 The Harvil Exercise Bike comes with a wider base tube for better support and stability, comes in both aqua and peach colors, measures 26.4L x 20W x 46H, weighs 44 pounds and has a max weight capacity of 330 pounds. This new design includes a heart rate grip sensors on the handlebars and a digital monitor to keep track of your speed, distance, time, heart rate, and calories burned. According to user reviews, this bike appears to be very suitable for even those users well under 5” in height yet still adjustable for a user up to 6.3” in height. 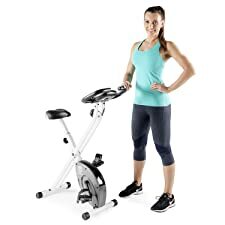 The Leisa Hart folding exercise bike by Body Rider is known for its retro look and modern build gives you the unique option of converting from an upright exercise bike to a recumbent bike by simply adjusting the seat. This exercise bike measures 39.5” x21” x 47.5”, weighs around 44 pounds with transport wheels, and has a maximum weight capacity of 250 pounds. This bike offers 8 levels of magnetically adjustable settings controlled with an easy adjustment knob and virtually noise-free operation. The seat is premium quality cushion foam, a backrest, and comes with 5 adjustable seat settings to accommodate user heights from 5” to 6.1”. Limited weight and height restrictions, but has the unique feature of converting from upright to recumbent by simply adjusting the seat. The Body Rider has a built-in tablet holder and built-in monitor that calculates exercise time, distance, speed, and calories burned, and an auto on/off. This machine offers an extended base for stable and secure footing and can be assembled in about 30 minutes. Another great exercise bike, but beware of the weight restriction and the height limitations. The Sunny Health SF-B2710 folding exercise bike is probably my favorite among the combo upright and semi-recumbent bikes offered on this list. It not only has these 2 options but also included resistance bands positioned at the top and bottom of the bike for an added upper body and lower body workout. (Runner-Up): Voted second best folding exercise bike in our review. 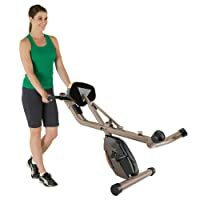 Great combo adjustable upright to semi-recumbent exercise bike with leg and arm resistance bands for a full body workout. With both the arm and leg resistance bands, you can now target various leg and upper body muscles for strengthening and toning purposes. Now you can work out your glutes, inner and outer thighs, and even your shoulders and arms all on one machine. The SF-B2710 has a comfortable well-padded and adjustable seat adjustable to fit inseam heights between 33 and 38 inches and a maximum weight capacity of 265 pounds and weighs 42 pounds. This low maintenance with durable construction bike offers very quiet operation with its belt-drive magnetic resistance system and 8 level tension knob. Other features include non-slip foot pedals with foot straps, a digital monitor to track distance, speed, time, calories burned and heart rate, a tablet holder, pulse grips located on the handlebars, transportation wheels for easy relocation. The Echelon Flex Bike Ultra is a heavy duty steel frame construction folding exercise bike measures 41H x 21.5W x 42.5L, weighs 39 pounds and has a maximum weight capacity of 300 pounds. The manual indicates the minimum height for this bike to be 4.11”. Designed with a comfortable seat and backrest, the Flex Bike Ultra can be used for both upright and recumbent cycling. And if that’s not enough it also includes built-in resistance bands that allow you to workout your upper body. Chose from 4 different colors to match your decor: black, purple, red, and royal. Switches from an upright bike to a recumbent bike, and includes built-in resistance bands for an upper body workout, all-in-one. This bike comes with noise-free multiple levels of magnetic resistance, adjustable seat, non-skid foot pedals, foldable design with transport wheels. The LCD control displays speed, exercise time, distance, scan, calories burned, and pulse rate. In most cases the seat level on the semi-recumbent exercise bikes are somewhat lower than the combo semi-recumbent exercise bikes, but still not as low as the non-folding full recumbent bikes. 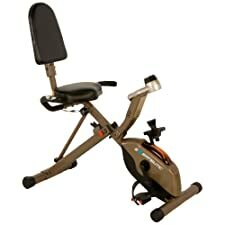 Finding a foldable semi-recumbent exercise bike appears to be much easier than finding a foldable full recumbent bike. The semi-recumbent bikes are slightly higher than the recumbent bikes but not as high as the upright. On average, the recumbent bikes which are not foldable, have a much higher price tag than the folding semi-recumbent bikes. Here are my top two foldable semi-recumbent exercise bikes I would highly recommend as they are very affordable yet good quality exercise bikes. Our first and number one choice is the Exerpeutic Gold 525 XLR with heavy-duty construction steel frame, a max weight capacity of 400 pounds, with dimensions of 48.5” x 24” x 46” and when folded at about 27”L x 18”W x 48”H and weighing 54.7 pounds. (Editor’s Choice for Seniors): Strong structure, great features, best folding exercise bike for seniors – easy to get on and off, with 400 lbs. max capacity. This bike comes with a precision balanced flywheel and v-belt drive making for a smooth and quiet workout experience. The large well-cushioned seat is adjustable for users from 5.2” to 6.5”. The Gold 525 XLR has an 8 level magnetic tension control system, hand pulse reader and LCD display for distance, speed, odometer, and scan, pulse and calories burned. Overall the Gold 400 XL has mostly the same features as the above Gold 525 XLR model except that it has a smaller and lighter weight construction and not as heavy duty as the 525 XLR. The Gold XL when folded is 20”W x 17”W x 54”H, weighs 39 pounds, and has a max weight capacity of 300 pounds. It too has a well-cushioned seat and will fit users from 5.2″ to 6.5″. The LCD display is slightly larger and tracks your distance, calories, time, speed, and heart rate. This bike also comes with the quiet V-belt double-drive transmission system, precision-balanced flywheel, and 8-level adjustable magnetic tension control system. The 400 XL has a slightly lower price tag than the 525 XLR model. Which is the Best Folding Exercise Bike for You? There are a few factors to consider when deciding what is the best folding exercise bike for your needs. The first thing to consider is weight. The maximum weight capacity for each bike may vary anywhere from 250 to 400 pounds. If you are in the upper range, I would strongly suggest using a recumbent bike over the traditional upright bikes. Most exercise bikes will accommodate most user heights, but few seem to fit the 5” and below user. If you are shorter than 5” you may want to check out the #3 Harvil Exercise Bike above. Age may also be a factor. I personally would recommend the recumbent bikes for everyone, but especially for all seniors and those who require added back support. They are very easy to sit on and are very comfortable to use. These recumbent bikes are always a favorite to our seniors at the gym. Other than that, any of the above bikes are a good choice and are quality exercise bikes I would recommend to anyone from beginner to advanced user. Indoor exercise bikes are great for cardio exercise and losing weight while in the comfort of your own home. Whether you’re a beginner or advanced fitness enthusiast, young or old, cycling is an excellent form of exercise for all fitness levels. There are no weights to be racked and adjusting the resistance level to meet your workout intensity is as easy as adjusting your pedal speed or turning a knob or even a simple press of a button. For beginners and seniors, I would suggest using close to no resistance and just getting yourself used to pedaling at a moderate pace for 10 – 15 minutes per day for a week. The following week perform the same routine but add slightly more resistance. After a week or two, you should be feeling stronger and have more endurance than you did when you first started. Now would be a good time to increase your workout time to 30 minutes. You will know your limitations, so just keep working your way up but in a slow and steady manner. You are always in control and can easily slow or increase your pace, or add or decrease resistance as you need. For the advanced fitness enthusiast, there is probably nothing I can add here that you don’t already know. So, my only suggestion here would be to enjoy your cycling. Oh. And if you haven’t tried high-intensity interval cycling, throw that into your routine once or twice a week. Let’s take a closer look at how folding exercise bikes can be beneficial to you as a home exercise machine. The following are some key benefits to consider. The indoor stationary exercise bike is a very effective means of losing weight and for cardio health. 30-minutes of moderate pedaling per day can burn around 230 calories, give or take. So depending on your body weight, metabolism and workout intensity, you could easily burn up to 500 calories in one hour. Besides losing weight, cardio exercise is proven to strengthen your heart and benefit your cardiovascular system overall. The exercise bike is not only great for cardio but also ideal for working your leg muscles. This would include the development of your calves, quads, hamstrings and glute muscles. When using these bikes regularly at higher intensity levels, you will almost be guaranteed better muscle tone, improved strength, and added muscle development. There are various types of resistance controls and mechanisms built into these bikes which all generate friction or resistance in different ways. However, most resistance levels regardless of type can be easily adjustable with a simple turn of a nob or by adjusting a lever. One top benefit of the folding exercise bike is that fact that it can be easily folded and stored. These exercise bikes are sturdy enough to support 300 to 400 pounds of body weight, yet light enough to move from room to room. If you are short on space, this is the perfect exercise bike to add to your workout arsenal. Technology has come a long way from those old gear and chains and the strap-based bikes to the newer and whisper-quiet flywheel and magnetic-based resistance controlled bikes. Probably two of the most common and popular types of exercise bikes are the fan-based and the magnetic-based resistance bikes. Even though the magnetic-based are the more expensive bikes, they have come down in price tremendously. Therefore, as we all would rather prefer a whisper-quiet bike ride in the middle of the night, I have taken the liberty to only include these bikes in our top 8 list below. Besides a whisper-quiet ride, we can now pedal away in the comfort of our own home. Whether rain, snow, hot or cold, day or night, there is no excuse not to take a 30-minute spin on your stationary exercise bike. You can even watch some TV or listen to music while doing so. While only using a circular rotation of the pedals, there is no jarring effect on your knee joints or otherwise. A great no impact exercise machine to avoid joint problems and for anyone in rehab. All of the foldable exercise bikes in this review are very affordable. And as said earlier, even what used to be the more expensive bikes with magnetic-based friction to control the bike’s intensity has become so affordable that it would only seem logical to choose these whisper-quiet bikes over the others. But this is just my opinion. I will explain more about these different types of resistance next, and let you decide. Magnetic-based resistance is the newer technology and is more advanced than any of the other resistance types. With magnetic resistance, there is no direct contact necessary to create resistance and thus no wear and tear or costly maintenance. Two magnets sit on either side of the flywheel. The flywheel roughly weighs between 30 and 40 pounds. And the heavier the flywheel the more resistance it can generate. Whisper-quiet operation with the magnetic-based resistance system – since no parts are touching the flywheel there is no friction or noise. Nonetheless, by adjusting these magnets you can change the resistance levels and thus the workout intensity. The closer you move the magnets to the flywheel the harder the resistance. The more you move them apart the easier than pedaling will get. Magnetic-based exercise bikes are whisper-quiet since there are no touching parts needed to create friction. These magnets can be controlled with a knob connected to a cable, or can even be controlled digitally with electronic signals coming from a control pad. A fan-based exercise bike creates resistance with the fan blades. To create resistance, you must pedal the bike and move your arms. The only way to increase the resistance is to pedal and move your arms faster. For this type of bike, we were unable to find any that could be folded. And as you may have noticed, this bike also incorporates handles to use both arms in addition to pedaling. And as expected, this bike is also much heavier than your typical magnetic or brake-based folding exercise bike. Brake-based resistance uses pads that create direct friction on the flywheel, either from the top or each side of the flywheel, to control the tension on the pedals. Usually, an adjustment knob or lever is used to tighten the pads on the flywheel much like the brakes on a car or even your typical outdoor riding bike. The much older technology for controlling tension is the strap-based resistance. 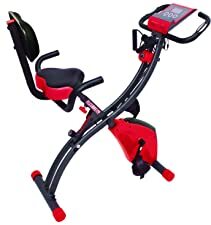 These exercise bikes use straps or belt mechanisms to adjust the resistance levels. Resistance is adjusted by increasing the brake tension on the strap or belt directly. Over time, this will cause wear and tear on the braking mechanism and belts which could result in costly maintenance or replacement parts. If you are looking for a foldable exercise bike it is important that you make the right decision the first time and save yourself the headache of having to return your product or even get stuck with one that is not suitable for your needs. That said, let’s take a look at what you should know before making your decision. The construction of your exercise bike should be sturdy and support your weight class. It is important that you check the maximum weight capacity for the exercise bike you are interested in. Typically any bike constructed of heavy duty and high durability steel will support most weight classes. Granted exercise is not meant to be comfortable, however in this situation, if the bike is not comfortable for you, it will most likely not be used as much or not at all. I am not necessarily referring to the seat itself, as these bikes all have great cushioned seats and are not too small either. But what I am suggesting is that you decide on whether you are better serviced with the traditional upright bike or the recumbent bike. As I mentioned before, if you are more experienced and enjoy regular cycling then the traditional upright should be just right. However, if you are a senior or have a problem with your back, then the recumbent exercise back would better serve you. Is the exercise bike fully adjustable? Being able to adjust your seat is important. Make sure your exercise bike can be adjusted to meet your body type. In some cases, adjustable handlebars may also be necessary. Any exercise bike should have at least 8 resistance levels. 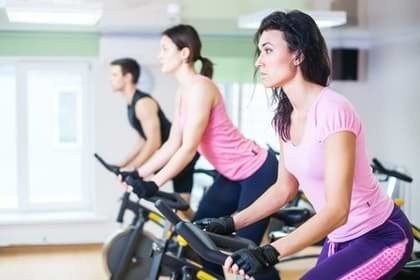 Resistance is important for any exercise routine and is no different for indoor cycling. Adjusting the resistance mimics the resistance of pedaling on an even surface to various degrees of uphill pedaling. 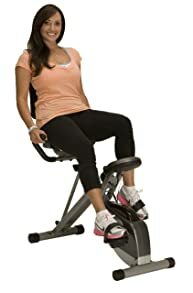 Thank you for reading our article on the “Best Folding Exercise Bike Reviews for 2019”. Hopefully, we were able to provide you with enough useful information to help you make an informed decision. If you are truly interested in investing in an affordable indoor cycle, then the foldable exercise bikes are by far the least costly choice. 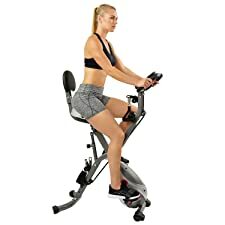 Though very inexpensive compared to other indoor exercise bikes, the bikes in this review are nonetheless top quality bikes for both beginners and advanced users alike. With very low noise, smooth pedaling, magnetic resistance, strong and durable framework, and features such as pulse rate readers and digital displays to name a few, you can’t go wrong. If you found this article useful, give us a like or share us on social media. Top Vertical Climbing Machines for your home for a full-body workout. Best Recumbent Bike Review for 2018 – best quality, best price!